This dish is all about what you decide to add for flavor. While a heavy handful of minced garlic would suffice, some smoked paprika, cumin, curry, chili flakes, cayenne, or chipotle pepper would be way more exciting. 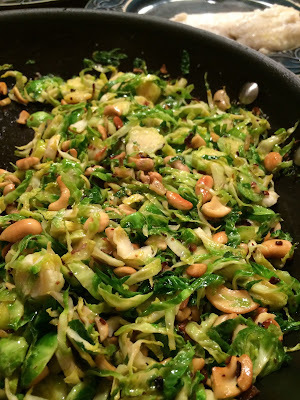 To shred the Brussel sprouts, hold them by the stem end and slice thinly with a sharp knife. Figure about five or six per person. Next, heat a large sauté pan over medium heat and add a couple handfuls of cashew pieces. Toss frequently to keep them from burning. Once you start to smell them roasting, slide them into a glass bowl and set aside. Immediately add some olive oil to the pan and sauté a minced shallot or small onion until translucent. Stir in a teaspoon or more of your chosen spice along with the cashews, cook for half a minute. 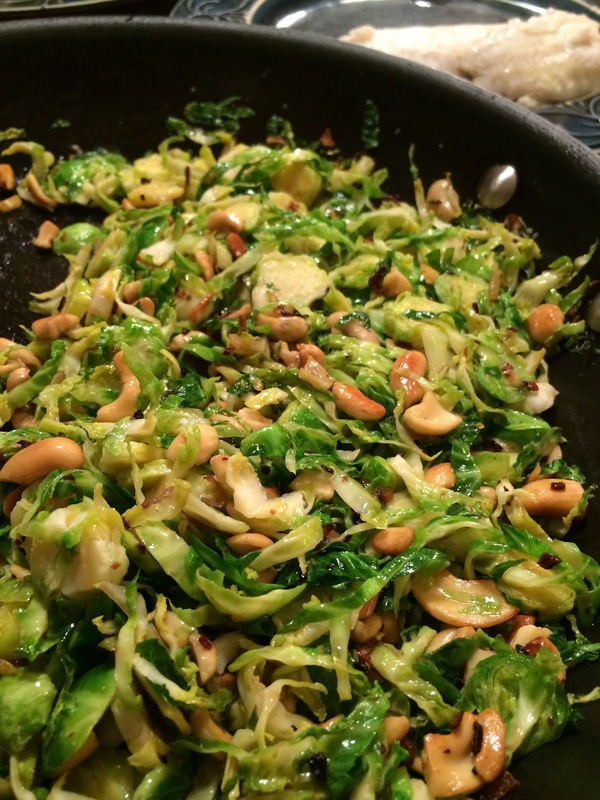 To finish, stir in the shredded Brussel sprouts and sauté until the sprouts are warm and wilted, but not soggy. It only takes a few minutes. And as always, salt to taste.